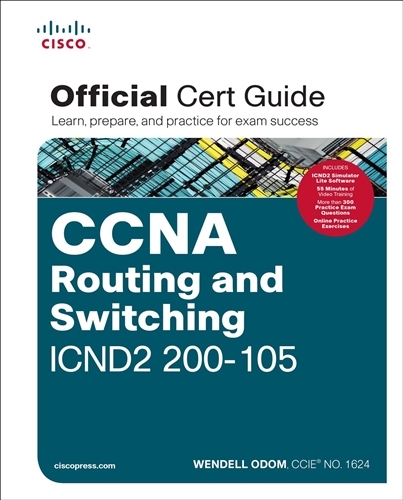 CCNA Routing and Switching ICND2 200-105 Official Cert Guide presents you with an organized test preparation routine through the use of proven series elements and techniques. “Do I Know This Already?” quizzes open each chapter and enable you to decide how much time you need to spend on each section. Exam topic lists make referencing easy. Chapter-ending Exam Preparation Tasks help you drill on key concepts you must know thoroughly. 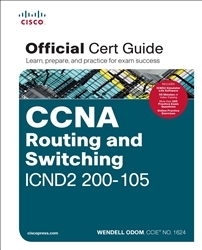 CCNA Routing and Switching ICND2 200-105 Official Cert Guide from Cisco Press enables you to succeed on the exam the first time and is the only self-study resource approved by Cisco. A free copy of the CCNA ICND2 200-105 netowrk Simulator Lite software, complete with meaningful lab excercises that help you hone your hands on skills with the command-line interface for routers and switches. The DVD contains more than 300 unique practice exam questions, ICND1 Network Simulator Lite software, online practice exercises, and 55 minutes of video training. Also available from Cisco Press for CCNA study is the CCNA ICND2 200-105 official Cert Guide Premium Edition eBook and Practice Test.. This digital-only certification preparation product combines an eBook with enhanced Pearson IT Certification Practice Test.